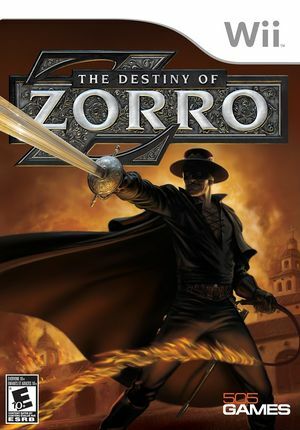 The Destiny of Zorro draws inspiration from the Mexican, Spanish and Native Southwest American cultures prevalent in California in the early 1800's the time of the original Zorro. Players will make an incredible action-packed journey through the sun-scorched coast and desert landscape Spanish California playing as the infamous Zorro the swashbuckling defender of the oppressed whose secret identity is the fictional wealthy caballero Don Diego de la Vega. Using the unique properties of the Wii controller, players can whip, slice and of course perform Zorro's signature 'Z' slash move to bring his foes to justice. The graph below charts the compatibility with The Destiny of Zorro since Dolphin's 2.0 release, listing revisions only where a compatibility change occurred. This page was last edited on 13 January 2018, at 14:35.